Zebra MC9200 - Standard, WLAN 802.11 a/b/g/n, Standard Range 1D/2D Imager, Color VGA Screen, 512mb/2GB28 Key, We 6.5, Bluetooth. Interface cables and charging cradle sold separately. For Single Slot Charging Cradle Kit (Part# CRD9000-110SES). For 4 Slot Charging Cradle (Part# CRD9101-4001CR), Power supply (Part# PWRS-14000-241R), DC cord (Part# 50-16002-029R) and AC line cord (Part# 23844-00-00R). 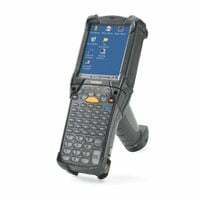 The MC9200 is the next generation in the industry-leading rugged MC9000 Series, now offering support for the most popular mobile operating system in the world, Android. Raising the bar on rugged mobile computing, the MC9200 offers well-proven technology that you and your workers can count on, with the very latest barcode scanning technology, a contemporary user interface and the power to run a new class of business applications that is every bit as easy to use and engaging as today"s consumer applications. As part of the MC9000 Series, the MC9200 is designed for all-day business use in the toughest environments - every day, millions of users around the world count on their MC9000 Series mobile computer to better manage inventory in warehouses and manufacturing plants, track baggage on airport tarmacs in any kind of weather and keep weaponry and vehicles on military bases in peak operating condition. The MC9200 - the next evolution in the world"s leading mobile computer for demanding environments. The Zebra MC92N0-G30SXARA5WR is also known as MOT-MC92N0G30SXARA01	or MC92N0G30SXARA5WR	.